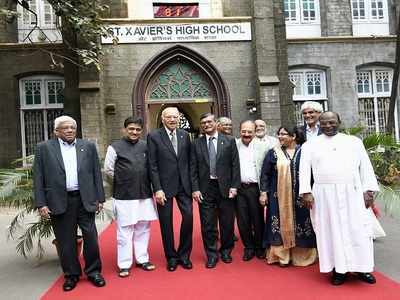 MUMBAI: One of the city’s oldest institutions with a roll call of illustrious alumni, St Xavier’s High School, Fort, will step into its 150th year in June 2018. As part of its sesquicentennial jubilee celebrations, the school, on Saturday, announced a series of initiatives in sports as well as events for the differently-abled. Also revisiting the school were notable alumni like former chief minister Ashok Chavan, HDFC chairman Deepak Parekh, neurosurgeon Dr Keki Turel, ENT surgeon Dr Milind Kirtane and chairman of Percept Limited Harindra Singh. “Whenever there was a movie or documentary in the auditorium, we sneaked out and went home as soon as the lights went off,” said Chavan, reminiscing about his school days. To commemorate 150 years, the school will host an inter-school cricket tournament named after its star alumnus, Sunil Gavaskar. It will also host football and badminton tournaments during the year. The school is planning sporting and non-sporting events for differently abled students from schools across Mumbai. “Our school is about all-round development of the student. We concentrate on best practices in extra-curricular activities as well,” said Jennifer Dias, the current and first woman principal of the school. Alumni have promised to contribute to the milestone celebrations. “You leave the school but the school does not leave you. We will do our best to meet the goals and vision of the school in whatever small and modest way possible,” said Parekh. The school conferred the Xavier Ratna 2018 on Dr Kirtane and academician and educationist Dr Beheruz Sethna.